Lieutenant General. Siswondo Parman was born posthumously in Wonosobo, Central Java, August 4, 1918. He was one of seven heroes and victims of atrocities PKI revolution. 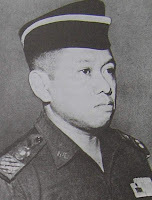 Men born in Wonosobo, Central Java is an intelligence officer, so much to know about the secret activities of the PKI that's why he was one of the officers who refused PKI plans to form a Fifth Force consisting of workers and peasants. Hostility and rejection which makes murder victims PKI. Public education is a school that had attended primary level, secondary schools, and the College of Medicine. But before completing his doctor, the Japanese had occupied the Republic so that his doctor was not until he has made. Once can not go to medical school, he briefly worked at the Bureau Kenpeitai. There he suspected that the Japanese were arrested, but was soon freed again. After that, he even sent to Japan to participate in education at Kenpei Kasya Butai. On returning to the homeland he returned to work on the Bureau Kempeitai. Beginning his career in law began by following the People's Security Army (TKR) is RI Army which was formed after the proclamation of independence. At the end of bulanDesember, in 1945, he was appointed Chief of Staff of the Military Police Headquarters (PT) in Yogyakarta.